A car is generally equipped with two brake pads per brake disc — eight in total. 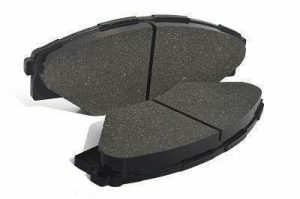 The brake pads consist of stainless steel support plates supporting a flat, dense “pad” of metallic compounds that face the disc. When you brake, the two pads will “pinch” the disc track to slow the wheel rotation. Most brake pads are rated for several years but will eventually wear down and require replacement. If you’re able to ignore the high-pitched screech of worn out pads, thinning pads will expose the metal beneath — and damage your rotors. Luckily, replacing brake pads is one form of brake repair that many people can do with most cars. Here’s a general step-by-step guide on how to replace your own brake pads. Please note that this only covers the process generally. This guide most likely won’t help you replace your own pads without additional information specific to your vehicle, or unless you’re under the supervision of qualified mechanic. To replace your own brake pads we HIGHLY recommend referring to the owners manual for your car or bring your car in for professional brake repair. Please use extreme caution and don’t rely on this guide alone if you are going to attempt to replace your own brake pads. Here is a step-by-step guide on how to replace your brake pads before it gets too late. Make sure the vehicle is cold. If you have just driven, the pads, calipers and discs may be extremely hot. Raise the car with the jack and place a candle or bracket under the vehicle chassis. Remove the wheel concerned. You now have access to all the braking parts and you can reach them safely under the car. To change the brake pads, first, remove the caliper. Use your wrench to loosen the clamp fixing bolts in place, then remove the bolts completely (or if possible). You should now be able to see the brake pads. They are usually held on the stirrup by pins or bolts or sometimes both. Take it all apart, we’re here! For front brake calipers: A good screwdriver will be enough to push back the pistons (these pistons are used to tighten the brake pads). Lean against the plate and push it outwards. Your brake pads are free; you can replace them. IMPORTANT: Be extra careful when removing the pins and loosening the caliper NOT to scratch the rotors. DOUBLE IMPORTANT: Don’t let the caliper hang by the brake line. This can cause damage to the line and ultimately lead to brake failure. Instead, attach the sling bar to a nearby suspension element using a rubber band or a piece of wire. Note: If you’re replacing your rear brake pades, check to see if the parking brake is on. If it is, disengage. Parking brakes normally grip the rear rotors when engaged. To install the new brake pads, you must manually push the caliper piston back. As your brakes are used, the caliper piston gradually comes out of its housing to compensate for pad wear. So you have to put it back in its initial position to position the new pads. Place the end of the screw against the piston. When you turn the screw, the clamp will increase the pressure on the piston. Keep it tight until you are able to slide the new pads into the caliper! From there, remove the used pads, and put on the new ones! Compare the old and new pads to see just how much your pads wear down over time. You’re now ready to reverse the steps. Make sure the pads attached securely, the caliper reattached, the wear indicator contact reconnected! Before starting, start the engine and “pump” the brake pedal until it becomes firm. This tightens the pads on the disc and allows the first braking. Not sure you did it right? Get a qualified mechanic to check your work throughout the process! We mean it!